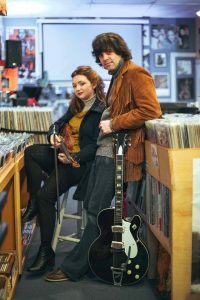 Drawing from 50s and 60s pop, American Songbook standards, and much more, this happy duo channels and fuses these influences through two voices, a guitar, mandolin, and violin to bring you a mixture of original songs and dusted off covers from the past. The two consist of Brad Bensko on Vocals and Guitar, and Kathleen Parks (of the 2018 Boston Music Award winning Twisted Pine) on Vocals, Violin, and Mandolin. While busy with performing and writing, they have been busy recording, mixing and now have officially released their first full length album of original material. Join them at an upcoming show to hear selections from their brand new album and fresh cuts from their favorite time periods! visit their website, check them out on facebook and listen here!